Over the past decade, more and more people have relied on yoga to provide a wide string of benefits: a more limber body, a stronger mind-body connection, and a way to relax after a tough day of work (or to prepare for the day). The art of yoga fits in well with Falls Church’s emphasis on a healthy, green, and active modern lifestyle. Whether you’re looking to get started with a yoga practice or you’re a seasoned yoga veteran, it’s easy to find a yoga studio in Falls Church, VA that suits your needs. The Yogi Underground is a true yoga studio, with the vibe and decorum of traditional yoga practice. Described as a “gem” in Falls Church, this studio is a great place to start if you’re looking for solid, basic yoga instruction. Check their schedules for course listings and special deals. As the studio is located only half a mile from West Broad Residences, you can easily incorporate a stop here for regular classes. You’ll leave feeling refreshed and ready to go! Blue Nectar Yoga is another good studio for beginners. Yelp reviewers say the instructors are knowledgeable and “super helpful!” Blue Nectar boasts two studios, incorporating both vinyasa flow yoga and traditional hatha yoga styles. For advanced practitioners, there are lots of fun advanced classes, including Rock ‘n’ Flow and Restorative Yoga. Bonus: Blue Nectar is located conveniently on W Broad St., just .3 miles from West Broad Apartments. Core Power Yoga is a hip yoga studio with a modern, athletic lean to it. For instance, check out their “Sculpt” classes, which incorporate weights and some heat to really get the core fire going. This spot is great for people who train in other sports and practices, such as basketball or martial arts, since the fitness benefits will be readily apparent across disciplines. Core Power Yoga is generally not crowded, and can accommodate a wide range of experience levels. Stretch your boundaries with this studio! “Hot yoga” is a newer yoga phenomenon involving elevated room temperatures during yoga classes. Under the safety and guidance of instructors, you’ll let go of tension and sweat out stress during hot yoga sessions. Many people find that a regular hot yoga sweat session is a unique, rejuvenating and detoxifying experience that can’t be achieved elsewhere. 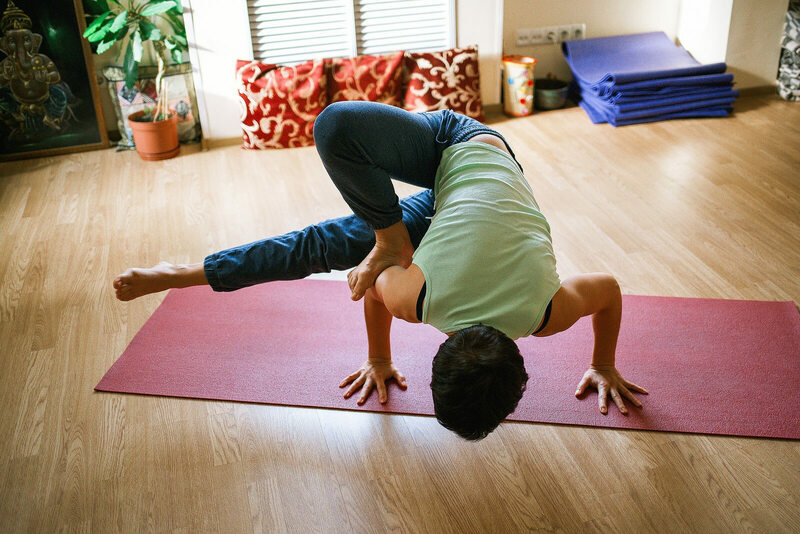 For an excellent lineup of hot yoga offerings, visit Bikram Yoga at Falls Church. All the classes are taught by officially certified Bikram instructors who have completed intensive training. Utilize local Falls Church yoga studios to learn routines and get feedback from instructors; then hone your skills in the comfort of your spacious luxury apartment at West Broad Apartments, or at West Fit Studio, West Broad’s own state-of-the art exercise facility, complete with yoga fitness room. If you’re interested in luxury living in Falls Church — where you’ll be surrounded by the best exercise, food, and retail establishments — schedule a tour today! You’ll love our luxurious amenities and beautiful floor plans. There’s a saying in the yoga community: “It’s yoga practice, not yoga perfect.” This is an inspiring reminder that anyone can improve themselves with dedication and perseverance. We like to think it applies to your home and lifestyle, too. Come see us at West Broad Apartments and let us help you achieve the luxury you crave.